It is of little surprise to learn that the sole composer behind Plastiq Phantom (who goes by the monkier qp) culls much of his material from his daily commute on a Seattle city bus. But one doesn't get the sense that qp is having difficulty navigating the cacophony of his surroundings: He seems to hear music in all that he sees and feels, using his sampler as as a stethoscope to check for the sonic pulse in everything from concrete to cars. His songs ask us to hear melody in the rhythm of our hectic lives. 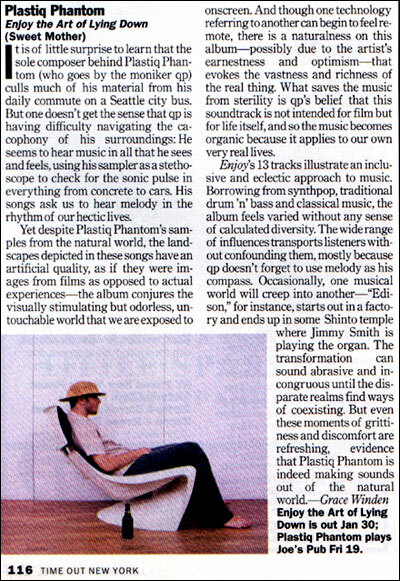 Yet despite Plastiq Phantom's samples from the natural world, the landscapes depicted in these songs have an artificial quality, as if they were images from films as oposed to actual experiences--the album conjures the visually stimulating but odorless, untouchable world that we are exposed to onscreen. And though one technology referring to another can begin to feel remote, there is a naturalness on this album--possibly due to the artist's earnestness and optimism--that evokes the vastness and richness of the real thing. What saves the music from sterility is qp's belief that this soundtrack is not inteded for film but for life iteslf, and so the music becomes organic because it applies to our own very real lives. Enjoy's 13 tracks illustrate an inclusice and eclectic approach to music. Borrowing from synthpop, traditional drum 'n' bass and classical music, the album feels varied without any sense of calculated diversity. The wide range of influences transports listeners with out confounding them, mostly because qp doesn't forget to use melody as his compass. Occasionally, one musical world will creep into another--'Edison,' for example, starts out in a factory and ends up in some shinto temple where Jimmy Smith is playing the organ. The transformation can sound abrasive and incongruous until the disparate realms find ways of coexisting. But even these moments of grittiness and discomfort are refreshing, evidence that Plastiq Phantom is indeed making soungs out of the natural world.